“What did you cook today?” four-year old Caleigh asks excitedly, as she comes bounding out the door of her preschool. Her mom trails behind her, beaming. “She gets so excited every week,” she says, as her daughter eagerly takes a sample of Cucumber Salad, the recipe for the week. Caleigh and her mom are coming to shop at the Farmer’s Market, held each Thursday during dismissal hours outside their child care center. The market is part of the Long Island Farm to Preschool Program, sponsored by Child Care Council of Nassau, Inc. through a grant funded by SNAP-Ed and the New York State Department of Health Child, Adult Care Food Program, Eat Well Play Hard in Child Care Centers obesity prevention initiative (NYSDOH CACFP EWPHCCC). 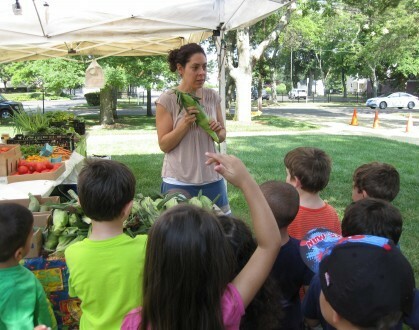 The program’s mission, to increase day care family’s access to fresh fruits and vegetables in underserved areas of Long Island, is carried out by bringing a weekly farmer’s market to three selected child care centers in both Nassau and Suffolk Counties. The program also began a new method of fresh, local produce delivery this season to a fourth site: the purchase of a ‘Fresh from the Farm’ Box, which is a weekly selection of produce delivered to the center every Thursday from a local farm. Caleigh and her mom stop by the Farm to Preschool Manager’s tent for samples and to pick up their weekly $2 coupon to spend at the market (funded through NYS DOH CACFP and SNAP Ed). They also receive a laminated copy of the weekly recipe and a pair of red potholders, the free kitchen tool giveaway for the week. Long Island Farm to Preschool provides food-related lessons for children at participating centers in the springtime, while also assisting in setting up garden beds on the school grounds. Children help tend the gardens throughout the season and often attend the market with their class or camp group. Registered Dietitian Dana Youkilis, who heads up the program, visits each center to teach the children about gardening, and the life cycle and parts of a plant through reading stories, hands-on activities and tastings. She also brings seeds and gardening supplies each spring, helps fill containers and beds with healthy soil, and plants vegetables with the children. The staff and children continue to tend the garden throughout the season. They water, weed and finally taste and cook the fruits of their labor. The program also extends to the families who purchase food at the markets, as well as the surrounding community. By accepting cash, debit, credit, food stamps, WIC Farmers Market Nutrition Program (FMNP) checks, and Senior FMNP checks, the program aims to provide a convenient place for community members to purchase fresh produce affordably from local farmers. With the 2015 season coming to a close, Ms. Youkilis is already thinking ahead to next season. She is hoping to continue to expand the education program through the winter and also hopes to be able to connect the centers with the farmers so that local, fresh produce can be utilized in meals and snacks served to the children during the school day. The Long Island Farm to Preschool program is part of a state wide initiative with multiple sites in Albany, Rochester and New York City. Monkey Business ECE in Wisconsin wanted to start an outdoor learning environment and participate in Farm to Preschool. This presentation explains the basics of Farm to Preschool, the goals of the movement, steps to get started and contains resources to support your efforts.